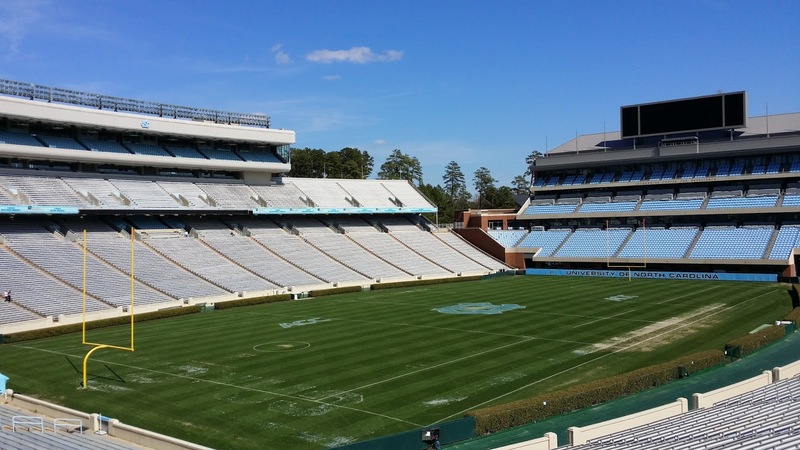 North Carolina opens its Atlantic Coast Conference schedule Saturday when the Tar Heels host Louisville at noon at Kenan Stadium. Saturday's contest, which will be televised on ESPN, marks the earliest ACC opener for UNC since the Tar Heels visited Wake Forest on Sept. 8, 2012, in Larry Fedora's first season. Carolina dropped last week's season opener 35-30 to Cal. Behind true freshman Michael Carter's 94 rushing yards and two touchdowns, the Tar Heels gained 219 yards on the ground. Sophomore Jordon Brown added 54 rushing yards as well as a team-high nine catches. No. 16 Louisville enters Saturday's game 1-0 after rallying for a 35-28 win over Purdue in Indianapolis. Reigning Heisman Trophy winner Lamar Jackson led the Cardinals with 107 rushing yards to go with 378 passing yards and a pair of touchdown tosses. Jaylen Smith posted team highs of eight receptions and 117 yards. Carolina has won back-to-back ACC openers, with both wins coming in memorable fashion. Last season, UNC beat Pitt 37-36 in Chapel Hill on a Mitch Trubisky touchdown pass to Bug Howard in the final seconds. Carolina converted three fourth downs on a 17-play, 63-yard final drive to win. In 2015, Marquise Williams led the Tar Heels to their biggest comeback in program history when Carolina rallied from 21-0 down to beat Georgia Tech 38-31 in Atlanta. Williams tossed a pair of touchdowns and caught another from Quinshad Davis in the victory, which sparked a perfect 8-0 ACC season. Saturday will be the first Carolina-Louisville meeting since the Cardinals joined the ACC. The two teams last met in a home-and-home series in 2011 and 2012, with the home side taking both. In 2011, the Tar Heels defeated Louisville 14-7 in Chapel Hill. In that game, Giovani Bernard rushed for 109 yards, Dwight Jones caught a 43-yard scoring strike from Bryn Renner and the Tar Heel defense limited the Cardinals to 273 yards to win a defensive struggle. Louisville won the return game one year later 39-34. Renner threw five touchdown passes and Carolina rallied to within five points after trailing 36-7 at the half. Saturday will be the eighth meeting in the series, which Louisville leads 4-3. Four of the seven previous meetings have been played in Chapel Hill. Carolina and Louisville first played in 1988. Louisville won that game, 38-34, in Chapel Hill. The two teams played a home-and-home series in 1995 and 1996. The Tar Heels won both of those contests. In 1995, Carolina defeated the Cardinals in front of an ESPN Thursday night audience when Mike Thomas connected with Octavus Barnes with 14 seconds remaining to take a 17-10 win. The following year, Carolina beat Louisville 28-10 in Chapel Hill.